Agra Gauze – Strong, transparent silk fabric of a gauzy texture. Agaric – A cotton fabric of loop yam construction, having a surface somewhat similar to a fine Turkish toweling. Alapeen. A mixed stuff either of wool and silk or mohair and cotton; mentioned in Observations on the Wool and the Woollen Manufacture by a Manufacturer of Northamptonshire, 1739. Armoisine – Also spelled “Armozeen” and “Armozine.” In the 18th century and earlier this fabric was used in both men’s and women’s wear. It was of a taffeta or plain silk texture. Armure – In olden times this was the spelling given to “Armor.” Comes in small patterns like bird’s eye, pebble, diamond and other designs resembling chain armor. Arras. (It. Arazzi) takes its title from a town of that name in the province of Artois in the north of France, where it was first manufactured. Asbestus (Fr. Asbeste; Ger. asbest.) Sometimes called Mountain Flax, Earth Flax, or Salamander’s Wool, a mineral substance of fibrous texture, of which several varieties differing in color and substance are found, all alike having the property of resisting the action of fire. The ordinary asbestus is a compact mass of filaments, and is found in nearly every country in Europe, including England (in Cornwall, Anglesey, and Aberdeenshire), as well as in Canada, Greenland, India, and Siberia. Varieties in form occur: sometimes it is found in thin cakes of closely-interlaced fibres (known as Mountain Leather), in small, brittle, curved sticks (Mountain Wood), and in masses woven with cellular openings (Mountain Cork). A more delicate and pliable fibre was called amianthus (Gr. amiantos, undefiled), a name given to it by the Greeks because of its coming out cleansed and pure after being passed through fire. This is found most abundantly in Corsica and Savoy. By the ancients asbestus cloth was used for enshrouding dead bodies during cremation, so that the ashes of the corpse might be preserved distinct from the wood composing the funeral pile. M’Culloch says this statement is corroborated by the discovery at Rome, in 1702, of a skull, some calcined bones, and a quantity of bones, all contained in a cloth of amianthus, nine Roman palms in length by seven in width. Its employment in this way was, however, confined to the very richest families, incombustible cloth being very scarce, and fetching an enormously high price (Dictionary of Commerce). Various applications have been made of asbestus. Paper has been made from it in sufficient quantity to admit of the issue of a book which could defy fire, and its use in this manner for important documents is advocated. The Brahmins of India are said to have used it for the wicks of their perpetual lamps, and it is still employed for a similar purpose in Greenland. Thread, armor, ropes, nets, and when mixed with clay, pottery have all been made from it; but it has principally been employed in making cloth, and is still manufactured into a material for packing purposes. The process of manufacture is to soak the lumps of fibre for a long time in water, and by repeated washings to separate the filaments from the earth which binds them together. The threads are then moistened with oil, and, mixed with a small quantity of cotton, are then spun and woven in the ordinary manner, after which the cloth is burnt to destroy the cotton and oil. Atlas. The German, Dutch, Russian, Polish, and Danish for satin is atlas, and Swedish atlas; but a silk stuff wrought with threads of gold and silver, and known by this name, was at one time imported from India. French Prince in the Reign of Louis XIV, 1670. 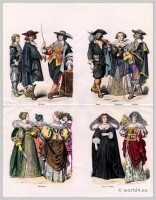 French fabrics 17th century, baroque period. 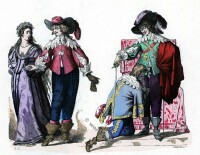 French prince and maid of honor costumes in the Reign of Louis XIV. Caps and hoods. 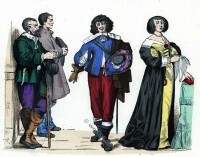 French fashion under Louis XIV. 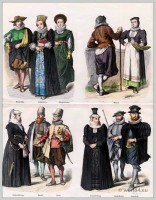 Venice fashion in 16th century. Bandanna or Bandana – From the Hindustani language meaning to tie or bind in a knot. Generally dyed in blue, red or yellow colors. Bandannas. Handkerchiefs of silk or cotton in which spots or figures are left in white or some bright color upon a ground of red or blue. They were originally imported from India, where it has been customary to produce these patterns by tying up the parts of the material which were to remain light, and subject the whole to the necessary dye. During the time of heavy import duties on silk large quantities were smuggled into England. Mr. Huskisson, in a speech upon the tariff, said, “I believe it is universally known that a large quantity of Bandanna handkerchiefs are sold every year for exportation by the East India Company. But does any gentleman suppose that these Bandannas are sent to the Continent for the purpose of remaining there? No such thing. They are sold at the Company’s sales, to the number of about 800,000 or 1,000,000 a year, at about 4s. each; they are immediately shipped off for Hamburg, Antwerp, Rotterdam, Ostend, or Guernsey, and from thence they nearly all illicitly find their way back to this country. Mark then the effect of this beautiful system. These Bandannas, which had previously been sold for exportation at 4s., are finally distributed in retail to the people of England at about 8s. each ; and the result of this prohibition is to levy upon the consumer a tax, and to give those who live by evading your law a bounty of 4s. upon each handkerchief sold in this country.” The extraordinary popularity of these goods induced English manufacturers to try to imitate them. The first method was to print by the ordinary process of blocks, but this failed to produce the clear, clean, sharply-defined lines of the foreign makes. After a time the Indian method was discovered and practised. Many claims have been put forward for the honour of this introduction. The weight of evidence is in favour of Mr. Henry Monteith, of Glasgow, as the first Bandanna prints made in cloths for garments are known to have been produced at Glasgow, and this gentleman is generally admitted to have been the first to use this method in that city. Bale. (Fr. balle, It. balla; literally a ball of goods.) To sell under the bale or under the cords was once used in France to denote a bargain concluded in bulk, without any sample or pattern being shown. Barras. A coarse kind of cloth; sack-cloth (Wright). A coarse linen fabric originally imported from Holland. Dutch Barras is mentioned in a charter of 1640 granted by Charles II. to the City to secure the rates of Scavage, Paccage, and Balliage, which “our well-beloved the Mayor and Commonalty and Citizens of the City of London” had previously exercised and enjoyed. Barrathea Cloth – Made in ribbed styles that alternate to produce a coarse granulated effect. This silk is of English origin, first made in both plain and twilled weaves. Barrège. An open fabric resembling gauze, but more open in texture and stouter in thread. It was made of various materials, but is best known as made of silk warp and worsted weft. When it became fashionable it was imitated in all-wool, and subsequently cotton warps were used. The stuff “takes its name from the district in which it was first manufactured, the especial locality being a little village named Arosons, in the beautiful valley of Barrèges. It was first employed as an ornament for the head, especially for sacred ceremonies, as baptism and marriage. Paris subsequently became celebrated for its barreges” (Ure). Barré – A striped or barred design, woven or printed, returning from selvage to selvage. Basket Weave – A silk deriving its name through the similarity to basket weaving. Batiste – Comes in plain, figured or woven designs with small patterns. The silk batistes are sheer in texture. Bayadere – Applied to fabrics in which the stripe, whether woven or printed, runs crosswise; that is, from selvage to selvage. Bedford Cord – A wool or cotton fabric having a corded effect running lengthwise of the piece, the cords being very slightly separated. Cotton Bedford cords closely resemble a wide-welt pique. Beige – A natural color or undyed fabric. Bengal Stripes. Striped ginghams, so called from having been originally brought from Bengal, and first manufactured in England at Paisley. Bengaline – A heavy corded fabric somewhat resembling poplins and is generally made with a worsted filling. Biretz – This is sometimes called “Electoral Cloth.” Made of silk and wool, being corded on one side and on the other of a cashmere or twilled design. Bergamot. A common tapestry, made of ox and goats’ hair with cotton or hemp, believed to derive its name from having been first produced at Bergamo, in Italy. Bluteau – Also known as “Bolting Cloth.” Of linen, hair or silk threads, characterized by the open mesh and used in mills for sifting flour, etc. Noted for the perfection and regularity of the weave. Boa. A long serpent-like piece of fur worn round the neck. A genus of serpents which includes the largest species of serpent, the Boa constrictor. Bobbin. A reel or spool (Ger. Spitzenklöppel, Du. Klossen, Da. Kniple-stokke, Sw. Knopelpinner, Fr. fuseaux, It. mazette, trafusole, Sp. bolillos, Port, bilros, Russ. Koklinschki). Also, a fine cord in haberdashery, in which sense the word is very ancient. In 1578 we find “Skotish bobin sylke,” and “bobbing” appearing in an inventory of that date in conjunction with twine and thread, plainly denoting its character. Bombazine – This fabric is of a silk warp and worsted weft. Botany – A fine grade of Australian wool. Applied also to yarns. Bouclé – Having knots, loops or curls on the surface. Usually employed for cloaking. Bourette – A rough surfaced effect, produced by introducing lumpy, knotted yams at intervals in the weaving. Homespun. Brillante – From the French meaning brilliant. This is a piece dyed fabric of a light, sheer weight, made of raw silk throughout. Chiefly used in millinery work and not recommended for other uses because of its tendency to slip. Broadcloth – A fine woolen cloth, having a smooth, glossy surface, with a twilled back. Brocade – This term is used in describing many fabrics besides silk. 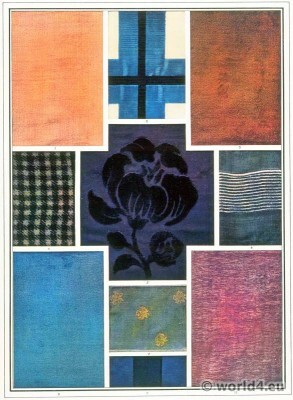 Shows floral, leaf, and other patterns in raised effects. In more expensive materials it is sometimes enriched with gold and silver. 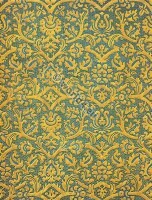 Brocatelle – Used for curtains and upholstery purposes. It is made of silk and wool, silk, silk and cotton, and all wool threads of more or less silky appearance. It is inferior to the previously described brocaded fabrics. Broché – The French term for “brocade.” Elaborate figures woven on the surface of the fabric. Cachemire de Soie – A broad silk material that has a fine twill, resembles cashmere in its finish. Mentioned in the play of Midas, 1592, by John Lyly, as calamance. Johnson thinks the word may by some accident probably be derived from Lat. calamancus, which in the Middle Ages signified a hat. The stuff was made in the present century principally as a checked material, checkered in the warp, so that the checks only appeared on one side. In the plain or striped varieties it was mainly used for skirting, and in upholstery. Canton Crepe – A fabric made of a fine quality of Canton silk of crepe weave, and heavier than crepe de Chine or crepe meteor. Cashmere – A woolen fabric of twilled construction and soft finish, having the twill on the “right” side. Challis – A light-weight, plain-weave dress fabric of wool or of cotton, or of cotton and wool; usually printed. Charmeuse – A light-weight crêpe satin having a high natural luster. Chenille Cloth – Has a chenille thread made in combination with cotton or worsted warp. Cheviot – A heavy, rough-surfaced woolen fabric, either twilled or made of knotted yams. Chiffon Taffeta – As its name indicates this fabric is a soft silk and has a fine lustrous finish. China Silk – This silk is made in China and sometimes is known as a China Pongee. The name is also given to a class of Asiatic materials of a semitransparent character. Is a plain weave with a lustrous finish. Chinchilla – A fabric made of fine wool, having a surface composed of small tufts closely united. Chine-Warp-printed. – A fabric wherein the design, being printed on the warps, appears somewhat faintly and in indefinite outline. Chirimen — A Japanese silk crape. Corah Silk — Comes from the East Indies, is of a creamy-white color, light weight and washable. Corset Cloth — A heavy satin in which swiveled figures are sometimes used. Principally for Corset Covers. Côte de Cheval — A cotton weave with ribs running lengthwise of the piece and made of silk, worsted or cotton. Cotelé — A silk of heavy ribbing that has from ten to twenty ribs to the inch. Covert — A wool or worsted cloth, usually in fine twill weave, in small mixture effect. Cravenette — A waterproofing process applied to fabrics made of silk, wool or cotton. Not a fabric. Crêpe — Also spelled “Crape.” There are several different kinds of fabrics in this class. They are of thin stuff crinkled in both irregular and parallel ridge designs. Crêpe Charmeuse — A piece dyed fabric with a dull luster. Made with grenadine silk for the warp with a crepe twist for the filling. Also the satin weave. Crêpe de Chine — A smooth lustrous fabric with a finely crinkled effect, is pieced dyed, has raw silk warp filled with alternating twists of hard twisted tram. Crêpe Lease — Resembles veiling. Very light and open and has both crepe warp and filling. Crêpe Lisse — An extremely light and highly glossed crepe material. Crêpe Metéore— This fabric has a fine twilled surface and is very lustrous. Crepela — As its name implies it has a small creped effect. Crepon — A fabric made of yarns having a different degree of shrinkage and having a crinkled or blistered effect. Croquete — French for “crackled.” Fabrics having a surface broken by irregular sunken lines, the patterns thus formed being either large or small. Crystalline — Very similar to Bengaline in appearance. Has a worsted filling. Damask — Gets its name from the city in which it was originally made—Damascus. A silk that shows figures on a ground of contrasting weave. Damassé — Applied to fabrics having a rich, woven design. Similar to damask. Dimity — A fine cotton fabric, plain or printed, having a cord design running lengthwise. Double Plush — A plush having a pile on both sides. Drap d’été — Used in connection with materials of a light weight, designed to make up in summer apparel only. Drap de Lyon — Sometimes called the “Cloth of Lyons.” Very rich quality of plain silk. Drap d’or — The English term for this is “Cloth of Gold.” Has a golden effect produced by an interweaving of tinsel. Drap de Soie — Also known as “Cloth of Silk.” Both skein and piece dyed. A medium heavy weight, all silk and serge combination. Duchesse — A satin fabric having the back woven in flat twills, with a smooth surface. Duvetyn de Soie — Made of spun silk and finished to resemble plush. Eolienne — A sheer silk and wool material. Also in silk and cotton. Epingle — This is a cross ribbed silk possessed of great wearing qualities. Eponge — Of a sponge-like texture used principally for dress purposes. Etamine — A sheer, open-weave of more or less transparent tissue. Faille — On the grosgrain order, but different in that it is soft and has flat ribs. Comes in plain colors. Failletine — A light and soft woven faille. Filet de Bruxelles — Woven from silk and cotton threads. Has a small sized six sided mesh. Fleur de Soie — In French this means “Flower of Silk.” Has a satin de Lyon face and a back of satin. Floconné — Having small flakes, in white or color. Frisado. A material of which very little is known, and of which we can only gain knowledge by inference. 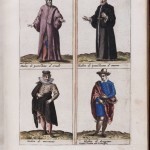 A manuscript in the British Museum, of date 1592, enumerates “Frisadoes of Pennystones wrought and frised, two goeth for a cloth, and being unwrought, four to a cloth, payeth custom .. £0 68 Frisadoes made of “Worseters, is taken for a long cloth, which is a cloth and eight yards, payeth custom … Frisadoes of Hastings making. None is entered by that name.” We may judge that it was a fine stuff at this period, for in an inventory of the stock of James Backhouse, of Kirbye-in-Lonsdaile, taken in 1578; redd friseadow is priced at 6s. 6d. a yard, then a very high price, and “Turkye culler” appears at 4s. the yard. A commoner quality, also red, is shown at 2s. the yard. In the Book of Rates of the following century “Frizado,” the piece containing twenty-four yards, is valued at £18s. Frock. A gown, particularly when worn by monks. The word is given as literally meaning a flock of -wool, from the Low Latin frocus— L. floccus, a flock of wool ; but the French froc, having the same root, and denoting a monk’s cowl, is most probably the only derivative of the term. ” nd her well-plighted (well-plaited) frock which she did won To tucke about her short when she did ride She low let fall.” Spenser: Faerie Queene, 1590. Foulard — A soft light fabric both piece dyed and printed. Made in two-and-two and other weaves. Futako-ori — A fancy cotton material from Japan. A little silk is used in the weaving to give it the proper effect. Gabardine — A light-weight twilled fabric, either of worsted or of wool; originally taken up for raincoats, but now used for simple dresses and tailored suits. The word at one time meant a long, loose garment. Gauze — Is thin and light and resembles voile. Made of hard twisted silk with doup weaving. Glacé — Originally applied to a fabric having a glossy, lustrous surface. Now often applied to “shot” silks; that is, plain weaves wherein the warp and filling are of different colors. Gloria — A silk warp with worsted filling, plainly woven and very durable. Cotton filled Gloria silk is also to be had. Used in covering umbrellas. Gossamer — A soft silk gauze of cob-web texture. Used in veilings. Granite — A weave in which the yarns are so twisted as to create a pebbled surface. Grenadine — The French Grenadines are a gauzelike silk material of open-work design and with plain or figured patterns. It is also made of worsted and cotton threads. The American Grenadines are coarse heavy materials in plain and figured patterns. Grisaille — This material has a gray effect produced by having warp and filling of contrasting black and white threads. Grosgrain — This is a silk fabric for dresses, having ribs that vary from fifty to seventy to inch. The ribbing is quite heavy and the material is plainly woven. Gros des Indes — This is the grosgrain of India. It is a silk dress fabric that has a rather broad diagonal weave. Gros de Londres — The grosgrain of London. It has heavy and fine ribs alternating and sometimes ribs of two different colors. Ribbing is of a cross design. Gros de Lyon — The grosgrain of Lyons. A coarse cross-ribbed material, skein dyed. Gros de Naples — A plain silken fabric made of stouter and harder thrown organzine silk than sarsnet or persian, and woven with more care and labour. Gros de Paris — The grosgrain of Paris. For description of this see Gros de Londres. Gros de Tours — The grosgrain of Tours. The cords in this fabric are very pronounced. It is a rich heavy ribbed silk, and although soft is very firm. Gros de Venise — The grosgrain of Venice. Haberject – A sort of cloth of a mixed color. Bailey. Mentioned in Magna Charta as a distinct manufacture, and probably one of the earliest fabrics made in England. 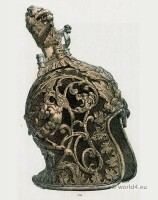 Thomson says it is the German al-bergen (cover-all), or Hals bergen (neck-cover). Essay on Magna Charta. In Brewer’s Dictionary of Phrase and Fable, it is said to have been a coarse thick cloth used for the habits of monks, but no authority is quoted for the assertion. Habutai — A plain, closely woven Japanese silk fabric. It has a heavy sizing in both warp and filling in the weaving, this is afterwards boiled out. Habutai silks are usually piece dyed or printed. Hammered – An uneven surface, as if the fabric had been beaten or pressed at irregular intervals. Hank – Literally that by which any thing is hung or fastened; two or more skeins of thread tied together. (Ice. hanki, cord; Low Ger. henk, a handle — henken, to hang.) 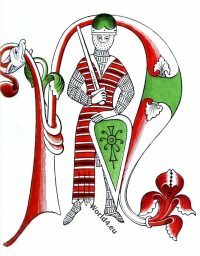 It is conjectured that the word Hank, signifying a skein of yarn, came from Hanckinus de Brabant, a weaver who, among others, received from Edward III. letters of protection to exercise his mystery of making woolen cloth in England. Harrateens – Shown in 1739 as a woolen stuff made of combing wool. Henrietta Cloth – Has a silk warp and worsted filling and is dyed in the piece. It is a twilled fabric that has a great many uses. Generally woven on three harnesses. Huckaback – A linen for towels with raised figures. Originally made from hemp, and only deemed fitting for the use of servants, but since imitated in fine linen, and now to lie had in varying qualities. “About a month ago, Tent and Turkey-stitch seemed at a stand; my wife knew not what new work to introduce; I ventured to propose that the girls should now learn to read and write, and mentioned the necessity of a little arithmetic; but unhappily, my wife has discovered that linen wears out, and has bought the girls three little wheels, that they may spin hukkaback for the servants’ table.” Idler, No. 13. India Silk — These silks are made in India. They are plain weave of a light weight and made for dyeing in the piece. Imperial – A fabric found in use in England during the 12th and 13th centuries under this denomination has roused conjecture, and caused some controversy. Dr. Rock quotes authorities who mention the stuff, and gives some theories which have been advanced to account for the title, with another one of his own. 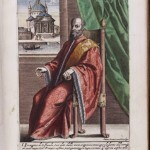 After stating that the stuff and its designation both came from Greece into this country at the end of the 12th century, the learned author adds: “Ralph, Dean of St. Paul’s Cathedral, tells us that William de Magna Valla, on coming home from his pilgrimage to the Holy Land, about 1178, made presents to several churches of cloths which at Constantinople were called ‘Imperial.’ We are told by Roger Wendover, and after him by Matthew Paris, that the apparition of King John was dressed in royal robes made of the stuff they call imperial. In the Inventory of St. Paul’s, drawn up in 1295, four tunicles (vestments for subdeacons and lower ministers at the altar) are mentioned as made of this imperial. 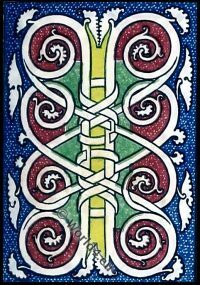 No colour is specified, except in the one instance of the silk being marbled ; and the patterns are noticed as of red and green, with lions woven in gold. It seems not to have been thought good enough for the more important vestments, such as chasubles and copes. Probably the name was not derived from its colour (supposed royal purple), nor its costliness, but for quite another reason: woven at a workshop kept up by the Byzantine Emperors, like the Gobelins is to-day in Paris, and bearing about it some small though noticeable mark, it took the designation of ‘Imperial.’ We know it was partly wrought with gold ; but that its tint was always some shade of the imperial purple is a gratuitous assumption. In France this textile was in use as late as the second half of the 15th century, but looked upon as old. 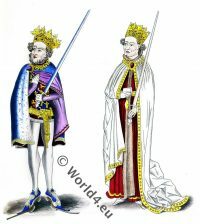 At York, somewhat later, in the early part of the 16th, one of its deans bestowed on that cathedral ‘two (blue) copes of clothe imperialle.’ ” Textile Fabrics. Ingrain – Grain colour [grana, Ital. and Spanish]. This name was given to Scarlets, Crimsons, and Purples, from the Kermes, Berries, which were used for the purposes before cochineal was known. BAILEY. Engrain, to dye deep, to dye in grain. JOHNSON. To dye in the grain, or before manufacture. Dyed in the grain, or in the raw material, as ingrained carpets, WEBSTER. To work into the natural texture; to impregnate the whole matter or substance. RICHARDSON. L. in, into, and grain, growth.) DONALD. In 1302 the famous Charta Mercatoria was published by Edward I., and from a confirmation of it in 1328 we learn that ingrain-dyed cloths were even then well known. In the third clause a duty of 2s. is laid upon “every piece of scarlet cloth dyed in grain ; and one shilling and six-pence for every other dyed cloth, in the dying of which grain shall be mixed; also twelve pence for every cloth dyed without any grain, and the like sum for every quintal of wax.” The wording of this clause supports rather the derivation of the word from the Kermes, berries, (which were also once known as scarlet-grains) rather than from yarns dyed before weaving, or in the grain. 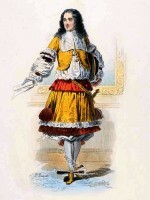 French baroque fashion. 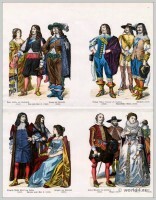 Louis XIV costumes. Ancien Régime. Japan Silk — This name is commonly used in connection with Habutai, although it covers a great variety of silks that Japanese manufacture. Jouy — Printings in small, floral effects on silk or cotton, similar to Pompadour designs. Named after village near Versailles, famous from 1768 to 1815 for its printed linens. Khaiki — A Japanese silk of plain weave, not so fine as Habutai. Kikai – A waste that comes from the reeling of raw silk. Ladies’ Cloth — A flannel finished in broadcloth effect. Lansdowne — Has a silk warp and worsted filling. It is a twilled fabric of light weight. Levantine — Foulards are often woven in this fabric which is of a twilled weave. Liberty Satin — A soft piece dyed satin fabric with raw silk warp and single spun-silk filling. Originated by Liberty & Co. of Paris and London. Lisse — Used for ruchings and trimming purposes. It is a gauze-like chiffon that has a crepe twist. Louisine — This fabric is made by weaving two or more warped threads together in a manner which gives a minute basket weave effect. The surface is coarse and of a mealy appearance. Lustrine — Is a stout silk fabric with a very brilliant surface. Maline — A fine net fabric of silk that comes from the city of Malines or Mechlin. Similar to tulle in texture. Marcelline — A fabric of tussah silk; semi-gloss taffeta; plain and closely woven, light, thin fabric. Lining for hat used. Marquisette — A sheer, plain-weave fabric of silk or cotton, having a mesh more open than that of voile. Matelassé — Having a raised pattern. Melton — Stout, smooth woolen cloth, similar to broadcloth, but heavier. Mercerizing — A chemical process by which a silk-like luster is imparted to cotton yarns and fabrics. Messaline — A sheer, diaphanous closely woven satin that is wonderfully soft and brilliant. Derives its name from Messalina, who was the wife of the famous Roman Emperor, Claudius. Milanaise Cords — The warp ribs in this fabric are made of cotton cords or some other bulky yam. The special silk threads are doup woven in a manner that will just cover the cotton cords. Mohair — The fine, silky hair of the Angora goat. A lustrous fabric, made from this material. Moiré — The effect of being watered or clouded is produced by a combination of heat and unusual pressure. Fabrics that have a pronounced rib show the moire effect to best advantage. Moiré Antique — This term is applied to rich qualities that show distinct markings of irregular nature similar to patterns used in ancient times. Moiré à Pois — Shows a water ground with small round spot patterns. Moiré à Retour — This fabric is especially woven for moiré patterns. It is folded so that only one half of the width is finished and then the other half is pressed so that the figure on the original half is reproduced on the other half. This insures the patterns being exactly alike throughout. Moiré Française — This is a striped moire in which patterns are produced by rollers of suitable width and spacing being used in the pressing. Moiré Impériale — There are no sharply defined lines in this pattern which is of an all-over watered effect. Moiré Métallique—As its name implies this moire has a metallic luster. Moiré Miroir — The making of this moire differs from the others in that two richly corded fabrics are woven together, one above the other. They moired without folding. This process gives a rich, velvety watered effect when the pieces are separated. Moiré Nacrée — An iridescent mother-of-pearl effect is obtained in these goods which are not folded in the middle. The watered lines are irregular and the cording is widely spaced. Moiré Poplin — Also known as “Watered Poplin.” Wool and cotton filled. The wool filled goods have a softer effect than the cotton. Moiré Renaissance — Designs are of the Renaissance origin and beautifully moired. Moiré Scintillante — From the French meaning scintillating, which gives an idea of its beautiful, glittering, watered pattern. Moiré Soleil — The surface is brilliant and shiny, but the pattern is somewhat indistinct. Moiré Suprême — This is the very highest quality of a watered satin. Moiré Velours — An all-over moired pattern with soft and pleasing lines. Mousseline de Soie — In reality this is a silk muslin which derives its name from the city of Mossoul, located near the site of the ancient city of Nineveh. It is chiffon finished. Mummy Cloth — Derives its name from the similarity in appearance to the cloth in which the Egyptians wrapped their mummies. It is of a rough, granulated character. Natte — If these goods are not properly bound they have a tendency to slip. The patterns are small basket weave. Nun’s Veiling — Originally a worsted fabric, but now also made in silk. It is a fine sheer material, principally used for veiling. As a rule it comes in black shades. Obiji — Of Japanese origin. It is used in making Japanese sashes. Ombré — Having graduated stripes in color which shade from light to dark, or vice versa. Organdy — A silk or cotton fabric light in weight and transparent as muslin. Ottoman — Ottoman fillings may be either silk, worsted or cotton. The ribbing is wide and flat and the fabric is heavy and plain. Paillette de Soie — The meaning of this term is “Spangles of Silk.” The spangled effect is secured in the coloring and weaving or by the application of spangles. Panne — A light-weight velvet with “laid” or flattened pile. Parisienne — A silk and wool fabric. Pastel — Applied to tones of any color when exceptionally pale. Chalk tones. Peau de Gygne — A closely woven silk having a lustrous, but uneven, surface. Peau de Sole — Peau de Sole is somewhat grainy in appearance. It is a soft and satiny fabric made in both double and single face. It is of a good quality and has a dull luster. Peau de Peche — Literally peach skin, similar to duvetyn, which see. Peau de Souris — Literally mouse skin. 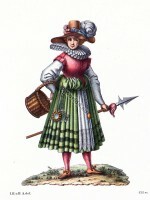 Similar to peau de peche. Pekin Stripe — The stripes in this pattern are usually satin and grosgrain alternating, the stripes usually being contrasting. Pekine, or Pekin Stripes — A color design in stripes of equal width and with equal space between. Piqué — A cotton fabric having wide or fine welts. Plain Weave — A weave in which every warped thread interlaces alternately with every filling thread. Plissé — Having an effect of fine folds or plaits. Plumetis — A sheer cotton fabric ornamented with tufts at intervals. Plush — The pile in plush is longer than that in velvet and is usually more than an eighth of an inch in length. The pile is principally of silk, worsted or mohair. Sealskin plush is obtained by imitating the real sealskin by the use of silk in the pile. Plush, Hatters’ — Hatters’ plush is used in making men’s high hats. It is a silk plush of special construction. Pointille — Having a design in small dots. Pompadour — Small floral designs. Pongee — Of Eastern origin, plain and canvas-like in appearance. It is usually a tussah or some dark colored silk boiled off or dyed in the piece. Poplinette — An extremely light weight poplin. Poult de Soie — A soft and thick satin fabric very rich in appearance. Pullicates — A kind of cotton handkerchiefs once in great demand; but principally for exportation. The rise of the manufacture here came about in this manner: “A species of pale orange-colored handkerchief, distinguished by the name of Madras, being in extensive reputation in the Caracas and other Spanish settlements in South America, at the period of the capture of Trinidad, in 1795, patterns were procured by some British traders, who ordered very large quantities to be manufactured in Scotland of the same quality and appearance. With such effect were these imitated in dye, in finishing, and even in the packages, that some hundreds of pieces %sent to London for exportation were actually seized at the Custom House as India goods, either illegally imported, or stolen from some of the Company’s ships in the river. A scrutiny, however, clearly ascertained that these goods were not Indian, but British, and that no trespass either against the privileges or the property of the Company had been even attempted. The goods were of course released and permitted to proceed to their destination, where, after examination and trial, it was found totally unnecessary longer to conceal their real origin ; and a very extensive trade through direct channels has been since carried on for similar goods.” Encyclopedia Brittanica. Quill — quilling. Ruffles, or plaits folded or quilled, probably from the folds being about the size and shape of a goose-quill, fit to admit a quill, or plaited in small successive ridges like quills. Quoif, Coif. 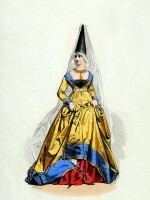 — A plain close-fitting head-dress worn at one time by both sexes. Radzimir — A broken twill effect made on eight harnesses. Ramie — A plant of Chinese and East Indian origin, from which a strong, lustrous fiber is obtained. Ranters — A stuff of combing wool of this denomination was made in England early in the 18th century. Rasdumore — A silk of the 18th century. See an advertisement quoted under Armozeen. This is the only instance in which the name has been found. Ratine — A fabric with surface resembling that of chinchilla cloth, but having smaller tufts with wider spacings between. Also applied to fabrics on the terry order. Rep — A fabric having a crosswise corded weave. Reps, Filling — Filling reps are ribbed lengthwise, only the fillings that make the ribs being seen. Reps, Warp — Warped reps are ribbed crosswise, so that only the warp which makes the ribs is seen. Rhadame — This fabric is of a very good quality, and has a rather indefinite twill. It is made on twelve shafts. Rice Cloth — A cotton fabric of sheer construction in which small nubs or knots appear at intervals. Roman Stripes — Usually has a cotton warp, but none of the warp shows. Patterns are brilliant cross stripes of contrasting colors and silk filling woven so as to make a reversible cloth. Royale — A plain ribbed fabric with ribs broken at frequent intervals. Sarcenet — Has its origin in a material made by the Saracene. It is a firm thin woven silk that resembles taffeta. Satin — A foundation or basic weave, in which the filling is arranged to bind the warp as seldom as possible and is so spaced that, on the face of the fabric, practically nothing shows but the warp, thus making an extremely smooth and lustrous face. Satin Charmeuse — Usually made with spun silk filling. It is a piece dyed satin fabric that has a hard twisted organzine warp. Satin, Cotton-back — Cotton back satin is most commonly used for lining purposes. Has a raw silk warp and cotton filling. It is pieced dyed. Satin Crêpe — Gets its name from a rich satin warp and crepe twist filling. It is very hard to dye perfectly. Satin de Bruges — A satin of Bruges. A silk and wool fabric with a satiny surface especially designed for upholstery purposes. Satin de Chine — The satin of China. Satin de Chine has a crepe-like finish and is possessed of soft draping qualities. Satin de Lyon — The satin of Lyons. This is a satiny cloth woven in a three harness twill. It is of firm construction and skein dyed. Satin, Double-faced — Has both back and face warp and is reversible. Satin Duchesse — An all-silk satin of a very rich quality. Woven on eight or twelve harnesses. Satin Façonné — In French the meaning is “wrought or figured” satin. Distinguished by handsome Jacquard figured patterns on satin grounds. Satin Feutré — A satin fabric with single spun silk yarn filling. Has a furry back, is woven on eight shafts and piece dyed. Satin Luxor — A rich satin that is also known as a double-faced peau de soie. Has a rich and subdued luster. Satin Merveilleux — The warp and filling are usually of contrasting color. Has a light and lustrous twill. Satin Taffeta — As its name implies, it is woven with satin on one side and taffeta on the other. Satin Ture — A satin fabric with a fine chevron cross-over pattern. Serge — Although serge is now usually made of worsted thread, it was originally a twilled silk fabric. Serge Moirée — A plain or striped ribbed fabric with spun silk warp and glazed cotton filling. Is moired finished. Shantung — Originated in the Chinese providence of that name. Ecru colored pongee or rough plain fabrics of Tussah silk. Shoe-Top Silk — Includes heavy twilled and satin fabrics to be used in shoemaking. Usually they have figured patterns and a cotton filling. Sicilienne — A worsted filled fabric with a corded silk warp. Sicilienne is also a light chiffon fabric, or a mohair of heavy weight. Surah Silk — A twilled silk generally woven two-and-two. The name is from “Surat” in India. Tabbinet — A fabric of silk and wool like a poplin. Used principally for upholstery work. Tabbis — The name “Tabby” is often used to denote a plain weave. It is an old term for watered or figured silk. Is rich in appearance. Taffeta — Ranges from 70 to 120 picks per inch, with an average of 90 to 100. These silks are skeined dyed, plainly woven and have a fine crossed-ribbed appearance. For dress purposes. Taffetaline — This is a piece dyed fabric with a plain weave. Has spun silk filling and organzine warp. An imitation of taffeta. Taffetas Chameleon — A multi-colored taffeta, with a changeable iridescent effect. Generally made with two colors in the filling and a third color in the warp. Taffeta Chiffon — A soft and lustrous taffeta silk. Much heat and pressure is used in securing the soft draping qualities of this fabric. Taffetas Façonné — These taffetas are distinguished from others by beautiful Jacquard patterns. Taffetas Lustré — A stout taffeta silk with a brilliant finish. Taffetas Uni — Applied to all plain taffeta silks. “Uni” is French for plain or smooth. Terry — A weave in looped effect. Another name for eponge and some forms of ratine. A velvet in which the loops have not been cut. Tie Silks — These are used in making men’s neckwear. A large variety in both plain and fancy patterns. Tricot Silk — This fabric is also sometimes made in wool. Has a very narrow inconspicuous strip, resembling a knitted effect. Tricotine — A material of slightly modified tricot characteristics. Tulle — A plain, fine silk net. Practically the same as maline. Tussah — The wild silk from which shantung and pongee are made. Applied to these fabrics when heavy and coarsely woven. Twill — Applied to weaves showing a diagonal effect. Twill is one of the three basic weaves and is made in almost countless varieties. Umbrella Silk — Used for covering umbrellas. Have specially woven selvages and a dye suited to the purpose. Both plain and twilled. Uni Silk — A term used in describing plain or smoothly woven weaves. Usuginu — A thin Habutai. Velour — In French “velours” (velvet). Applied to certain fabrics having a velvety or plush finish. Velour de laine, or wool velour, is a wool fabric with a plush-like surface. Velour du Nord — A silk velvet of weight half way between ordinary erect pile velvet and plush. Velours Chiffon — A light, soft and pliable velvet known in English as chiffon velvet. Velours Embossé — Means embossed or stamped velvet. The patterns in this fabric are finished in relief sometimes secured in the weaving. They are also produced by printing with embossed rollers. Velours Envers Satin — A reverse satin velvet with satin back and velvet face. Velours Epinglé — A pinned velvet which is similar to wire velvet. Velours Panne — A faced velvet having a peculiar luster obtained by finishing with a hot pressing or ironing effect. Velours Russe — A Russian velvet. Velvet — These fabrics are made with a plain back and short, soft, thick pile face, which if longer than an eighth of an inch is called plush. A great deal of spun silk is used in velvets although they may be all silk or all cotton, or only have a silk face. Velvet, Chenille — Has a double-faced velvet effect obtained by the chenille filling. Velvet, Cut — A velvet with a face filling effect obtained by cutting rows of loops with a knife, to produce the pile. Some fabrics have velvet figures made in this way. Velvet, Mirror — This velvet has the pile ironed down. Velvet, Uncut — Made the same as the cut velvet, but without the looped pile being cut. Velvet, Wire — This velvet has regular rows of loops across it which are cut to form the pile. The regularity is obtained by running a series of wires under the pile warp while weaving and then withdrawing them before cutting. Velveteen — A cotton velvet that has both cotton pile and cotton back. Venetian — A wool fabric, closely woven, in a fine twill. Venetian Velvet — An organzine velvet, yarn dyed. Vestings — These materials are heavy, often cotton mixed and made in fancy patterns. Used for making vests. Vigogne — The French form of the word “vicuna;” applied to a soft woolen dress material. Vigoureux — A worsted material, printed in the warp so as to produce a melange, or mixture, effect in coloring. Voile — A sheer, semi-transparent, plain-weave fabric of silk, wool or cotton plain, or ornamented with stripes or figures. Whipcord — A fabric with pronounced ribs or cords diagonally woven. Worsted — A yarn or thread spun from long-staple wool that has been combed, and fabrics made therefrom. Zibeline — A dress or cloaking material having a hairy surface. Dictionary of Dress. 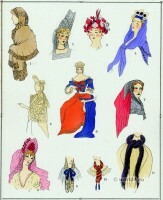 Encyclopedia of Costume and Fashion. 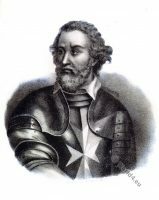 Ferdinand II Archduke of Austria. 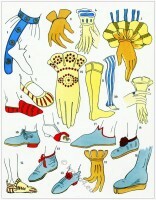 Renaissance shoes and gloves. Les modes de la renaissance.